I recently received the happy news that my article, ‘Material Worlds: The Shared Cultures of Southern Italy and its Mediterranean Neighbours in the Tenth to Twelfth Centuries’, will be published in the peer-reviewed journal Al-Masaq. Islam and the Medieval Mediterranean, published by Routledge. It will appear in the third issue of volume 23 later this year. I wrote the article based on a paper I gave at the Society for the Medieval Mediterranean conference in Exeter in July 2009. 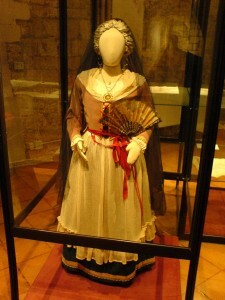 It compares the dress and textile cultures of southern Italy, Fatimid Egypt (through the Genizah document archives) and the heartlands of Greek Byzantium. Several points of similarity and affinity existed between the vestimentary systems of the ‘consuming classes’ of the Mediterranean in the central Middle Ages but there were also notes of difference that are illustrated in some of the comparisons I make. I argue for a more social anthropological approach to be taken with descriptions of dress and textiles and suggest that the Mediterranean does work as an heuristic device for such an exercise. We lose sight of comparisons when we only work within our disciplinary traditions, in this case, ‘western Latin’, ‘Byzantine’ and ‘Islamic’.